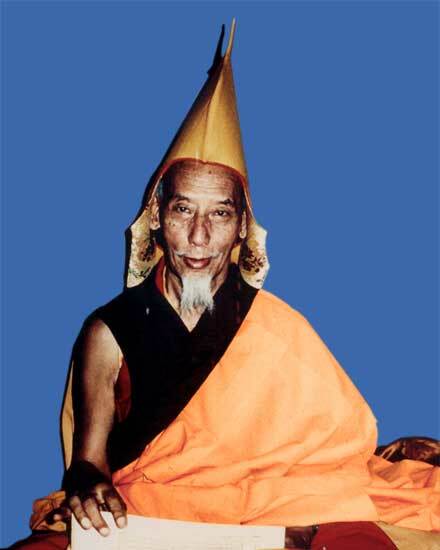 Zongtrul Jetsun Losang Tsondru Thubten Gyaltsen, or Venerable Kyabje Zong Rinpoche, was born in 1905 in Kham, eastern Tibet. His father and both his grandfathers were tantric practitioners and two previous incarnations of Kyabje Dorje Chang (“Vajradhara, Lord of Refuge,” as Kyabje Zong Rinpoche was also known) had taken birth within the Zong-go family: Zongtrul Phuntsok Chopel and Zongtrul Tenpa Chopel (1836-1899). It is said that when Zongtrul Tenpa Chopel was about to pass away, his niece’s husband came to visit him and successfully persuaded him to extend his life. Later, when Zongtrul Rinpoche was again about to end his mortal existence, his niece’s husband made the same request. This time the master refused, but on being asked to take rebirth within the same family, he gave his relative three apricots. Rinpoche told him to eat one himself, to give the second to his niece, and to plant the last one in front of their house. “When the tree first begins to bear fruit,” Rinpoche said, “I will once again take rebirth in the Zong-go family!” Five years later, Zongtrul Rinpoche fulfilled his promise. In 1916, after Kyabje Zong Rinpoche was recognized as the new incarnation of Zongtrul Tenpa Chopel, the 11 year-old made a long and arduous journey to central Tibet. He came to study at Gaden Monastery, one of Tibet’s great monastic universities. 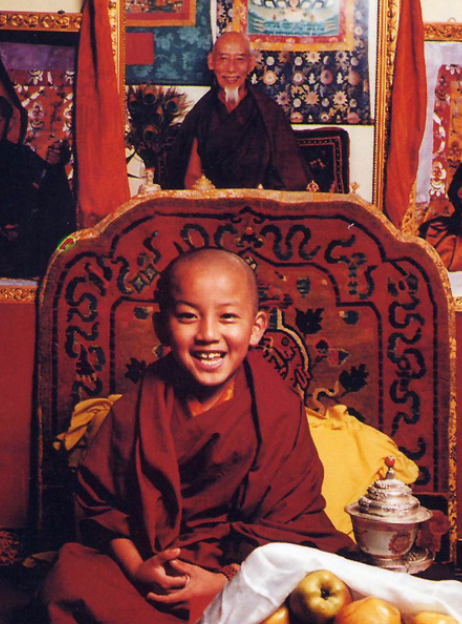 Upon enrolment, Zong Rinpoche was guided by the then 14 year-old Venerable Kyabje Trijang Rinpoche, and Kyabje Trijiang Rinpoche also became the chief mentor of Zong Rinpoche. The young monk lived a simple lifestyle. Instead of a table from which to read the scriptures, he made do with an empty tea box supported by bricks. He was completely focused on his studies, which he pursued with unfailing courage and diligence. He seemed disinterested in food or drink, surviving on a very simple diet. With his humble lifestyle and shabby robes, often loose and torn from the physicality of the debate ground, he looked like any other boy from the remote province of Kham who had been fortunate enough to attend this prestigious monastic university. During an all-night debating session on Pramana between Ganden’s twin colleges of Shartse and Jangtse, he surprised the senior Jangtse scholars with the depth of his debating skills. During a similar session a year later, Zong Rinpoche’s performance led the famous Geshe “Amdo” Sherab Gyatso to remark, “There would not be a worthier debate on this subject even if Dharmakirti himself were here in person!” Along with his formidable skill in debate, Zong Rinpoche possessed a fertile intelligence and great powers of retention, and his name gradually became known throughout the three great Gelug monasteries of central Tibet: Ganden, Drepung, and Sera. In 1930 at the age of 25, Zong Rinpoche received the highest honors of Geshe Lharampa, Zong Rinpoche enjoyed an equally successful examination at Gyuto Tantric College. These achievements firmly established his reputation as an accomplished scholar. In 1937, Reteng Rinpoche, the Regent of Tibet, appointed 33 year-old Zong Rinpoche as Abbot of Gaden Shartse Monastery. The influence of Zong Rinpoche’s term as abbot is still felt today. 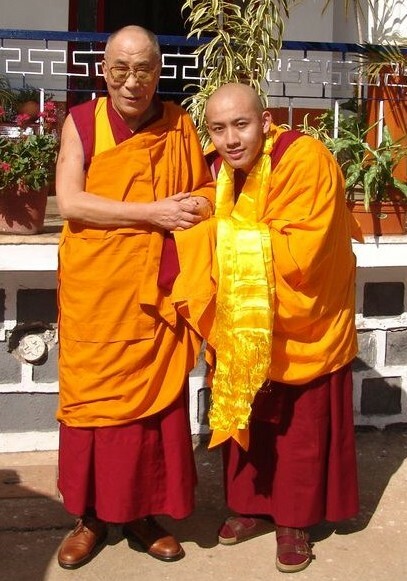 As well as reaching new heights of scholarship, Gaden Shartse became an outstanding example of monastic discipline, something that Zong Rinpoche held to be of vital importance. He also inspired a strong interest in Tantra, Chod, and monastic ritual, and significantly improved the monastery’s administrative structure. Having personally experienced the difficulties faced by its poorer members, Zong Rinpoche introduced reforms that went a long way toward improving their situation. After serving as the monastery’s abbot for over nine years, Zong Rinpoche resigned from his seat in 1946 and went on a long pilgrimage to southeastern Tibet. From that time onwards, intermittent reports were heard of Rinpoche’s removing people’s difficulties and obstacles through low-key demonstrations of tantric power. The well-known Geshe Rinpoche Tenzin Chopel, whose eyesight was so damaged that he was unable to walk unassisted. After Zong Rinpoche had conducted several eye-cleansing rituals, he was able to dispense with his cane and walk on his own. Zong Rinpoche calls the weather! In many areas of Tibet as well as at Gaden, Zong Rinpoche successfully subdued powerful local spirits so that they ceased causing harm and disturbances. Fields, plantations, and orchards were seen to increase their yields after he had visited and said the necessary prayers, and his ability to bring about and stop rain and hailstorms became legendary. In the aftermath of the suppression of his homeland in 1959, Zong Rinpoche left Tibet and joined the surviving members of Ganden, Drepung, and Sera in India. In 1965, upon request from His Holiness the 14th Dalai Lama, Zong Rinpoche took a position as the director of the newly formed Tibetan Schools Teachers Training Program in Mussoorie, overseeing 58 scholars from all the major traditions of Tibetan Buddhism. 2 years later, His Holiness the Dalai Lama appointed him to be the first principal of the new Central Institute of Tibetan Higher Studies at Sarnath, Varanasi, India. Kyabje Zong Rinpoche’s penetrating insights into everything he taught had a profound effect on all who heard them. His teachings, they observed, were not just intellectual, for he seemed to draw upon an inexhaustible fountain of direct personal experience. His skill as a teacher revealed itself in his ability to adapt his teaching methods to the views and temperament of the modern mind. He was known for his unique narrative style that was simultaneously highly engaging and absolutely straightforward. Kyabje Zong Rinpoche retained these wonderful qualities until the very last days of his life. When he passed away, he left behind the legacy of an energetic, compelling, direct and highly accomplished spiritual master. On November 15th 1984, this day marked Buddha’s descent into this world after returning from the Celestial Realm of Indra, would come to strike everyone with immense sadness and grief. Rinpoche normally awoke at three o’clock in the morning and finished his daily meditation before dawn. Tenzin Wangchuk told Rinpoche that he had called a medical doctor from the Dueguling Tibetan Resettlement Hospital half a mile away to give Rinpoche a check-up. It was shortly after nine o’clock in the morning when the doctor arrived. After the examination, the doctor told the students that he could detect no serious illness, only that Rinpoche was rather weak and could use some glucose. As the doctor didn’t have any glucose with him, he sent his assistant back to his clinic to fetch some. When the students entered the room a few minutes later, their beloved Teacher had left them for another realm. As he had prophesied, Rinpoche did not die in hospital, in pain, or from a serious illness. Those around him were amazed how Rinpoche’s body remained as if in a deep sleep, without losing luster or color. It was clear that their teacher was in a most subtle state of mind, embracing the meditation of clear light. He was eighty years old. On Saturday, the third day after Rinpoche’s passing, Kyabje Zemey Rinpoche and other high lamas gathered to conduct a self-initiation of Chittamani Tara, and the monks of Ganden Shartse, who had completed a Yamantaka retreat, conducted the self-initiation of Yamantaka. From the day Rinpoche had passed away the air had remained so still that barely a single leaf had rustled in the garden, but around three o’clock the weather suddenly changed and a strong wind came up, violently blowing the dust from the ground into the sky. When the wind subsided, word spread that Zong Rinpoche had arisen from the Clear Light state and had ascended into the enlightened realm. Residents of Mundgod also reported feeling land tremors before and after Rinpoche’s passing. Countless numbers of people, including abbots, high-ranking lamas, and geshes from all three monastic universities, came to pay their respects and take an active part in the rituals. Those who were present during these days witnessed many unusual signs. On the third day, just before the cremation hearth was lit, seven Indian ascetics clad in new saffron robes and leading a loaded elephant walked into the compound. When asked what they were doing there, they replied that this day marked a very auspicious occasion, and asked for an offering. Tenzin Wangchuk offered them bananas and money, and they left, satisfied. It was an unprecedented event, and everyone remarked that it was a very auspicious sign. Later, when monks asked the local villagers about the elephant, they couldn’t find anyone who had seen it. In Tibetan tradition, the elephant is often compared to a bull. When the reincarnation of Kyabje Zong Rinpoche was born on May 27, 1985, in the year of the Bull or the Ox. It became clear that the appearance of the elephant and the ascetics had had a definite significance. The twenty-fourth of November was the night of the full moon. It was one of the days that Rinpoche had circled in his diary before his death, and so it was on this morning that the members of Zong Labrang opened the cremation hearth. Lying among Rinpoche’s ashes they found his skull unburned and completely intact. Zong Rinpoche’s previous incarnation, Zongtrul Tenpa Chopel, who had died in 1899, had also left his skull intact. That relic, which bears the Tibetan syllable AH, is kept to this day at Zong Rinpoche’s residence as a treasure of faith and honor. When the cremation hearth was opened, a large quantity of relic pills were found between the two pans. Finally, when the lower pan was removed, everyone present saw in the sand mandala two unmistakable footprints of an infant, complete with heels and toes. The discovery of these extraordinary signs made everyone feel great peace, reaffirming their faith in their Teacher, and assuring them that his return would be swift. Kyabje Zong Rinpoche circled the dates in his diary! Some time before his passing, Kyabje Zong Rinpoche had circled three dates in his diary. The first was the date that he rose from the Clear Light state. The second was the day of the cremation. The third was the day the cremation hearth was opened. This made it very convenient for the disciples to plan and conduct the traditional arrangements, but the real message is of course, that Rinpoche had gone beyond ordinary death and rebirth. His last extraordinary deeds demonstrated a fully controlled, fearless death. They teach us that one day, everything must come to an end. Those present were indelibly impressed with the knowledge that practice and effort can enable one to completely transcend death. Thus, the life of Kyabje Zong Rinpoche became a teaching on how to live meaningfully and die well. Zong Rinpoche’s “precious tomb stupa” was completed in 1986 by members of Zong Ladrang. It stands five feet high, is covered with precious stones and metals, and is filled with relics and holy objects. Today, it stands in a place of honor in the center of the Zong Ladrang prayer room. Zong Rinpoche’s reincarnation was born in Northen India, in the Kullu Valley, revered by Hindus as a sacred site of Lord Shiva and his consort, Parvati. The Kullu Valley is also revered by Tibetan lamas as one of the 24 holy sites of Heruka Chakrasamvara. The present 4th Zong Rinpoche Tenzin Wangdak was recognized by His Holiness the Dalai Lama and enthroned at Ganden Shartse monastery in India. Like his previous incarnation, he also shows many heart-moving signs confirming that he is the real Zong Rinpoche and has only changed his physical outlook. Zong Rinpoche is currently fully engaged in the study of Sutra and Tantra at Gaden Shartse Monastic University, and was under the care of His Eminence Khensur Lati Rinpoche all these years until 2010 when Lati Rinpoche passed away. For internal circulation only, not for commercial purposes.